|SOURCE| Bose Einstein condensates (BECs) have been around for more than 20 years now. 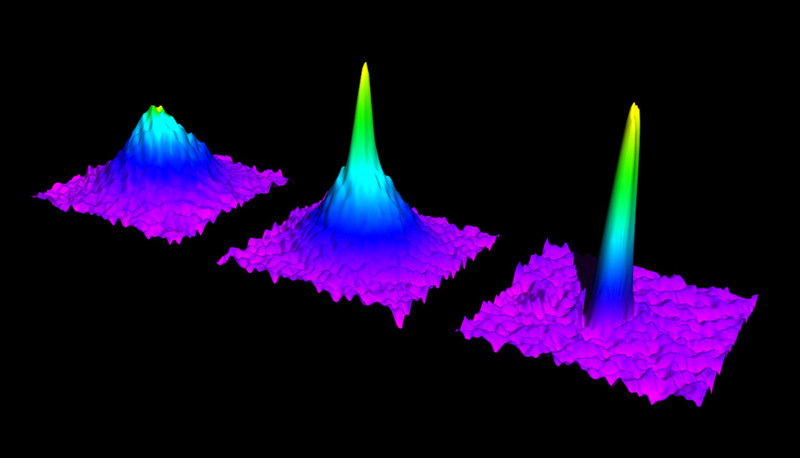 One of the best applications of the BEC, it turns out, is as a tool to explore other quantum things, like solids—yes, the properties of solids are determined by quantum mechanics. Bosons are different. Bosons will happily get together and party in the same state. Not only do they not mind having the same state, they love it. If a couple of bosons find themselves in the same state, they will immediately call all their friends and try to get them to join in. And if the bosons have a way to shed enough energy, they will. The result is that it's relatively easy to create a very cold gas of bosons that are all in exactly the same quantum state, called a BEC. One of the slightly weirder observations of BECs is that certain types of BEC will form arrays of droplets when the conditions are right. We've seen them form a series of evenly spaced globs of relatively high density, but we don't know why they do this. We also don't know what properties these droplets have.